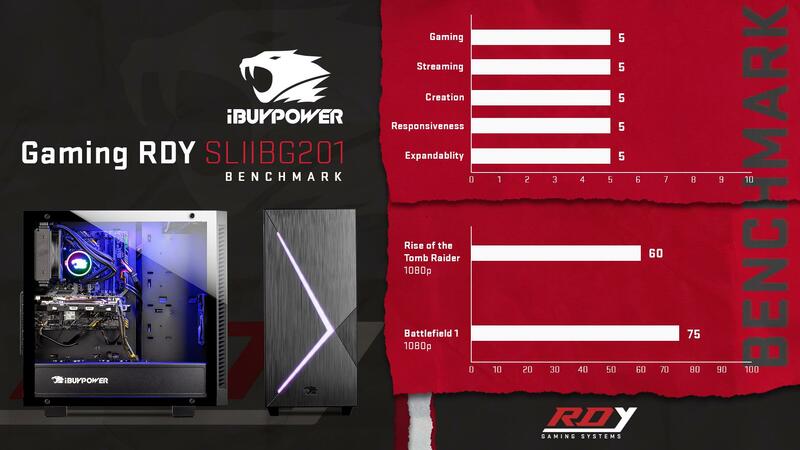 iBUYPOWER announces their new line of Gaming RDY “Rush Delivery to You” systems, professional-level gaming PCs with a delivery speed to rival the fastest in the business. Purchasing an iBUYPOWER Gaming RDY system guarantees same day shipping* to help customers get back into the games they love without delay. No additional fees. No hidden charges. iBUYPOWER Gaming RDY systems feature the latest technology, including 9th generation Intel® Core™ processors and NVIDIA® GeForce® RTX 20 series graphics cards with brand name components. These PCs undoubtedly have the power to handle competitive gaming, streaming, and VR, all inside of sleek and modern cases. 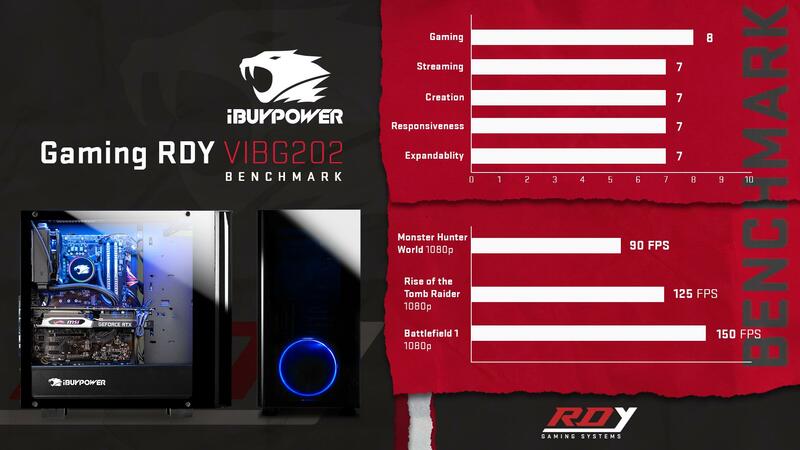 Below are benchmarks for some of the iBUYPOWER Gaming RDY systems. Compete harder and play in ultra graphics capable of 1440p or 4K at 60 FPS+. Take the next step in achieving your highest rank with the right tools for the job. No limits gaming is provided by the Intel® Core™ i7 9700k, NVIDIA® GeForce® RTX 2070, and the rest of your new arsenal. Conquer all of your favorite games in the highest settings possible with a pure, unthrottled gaming computer. With the Intel® Core™ i7-9900k, NVIDIA® GeForce® RTX 2080 TI, and the rest of your new loadout, your possibilities and skill ceiling are as high as you allow them to be. Customers who purchase iBUYPOWER Gaming RDY systems during the month of November will be able to take advantage of exclusive Black Friday and Cyber Monday deals at killer value. All iBUYPOWER PCs include lifetime tech support and a standard three-year warranty that covers three years of labor and one year of parts. Additional warranty options available. 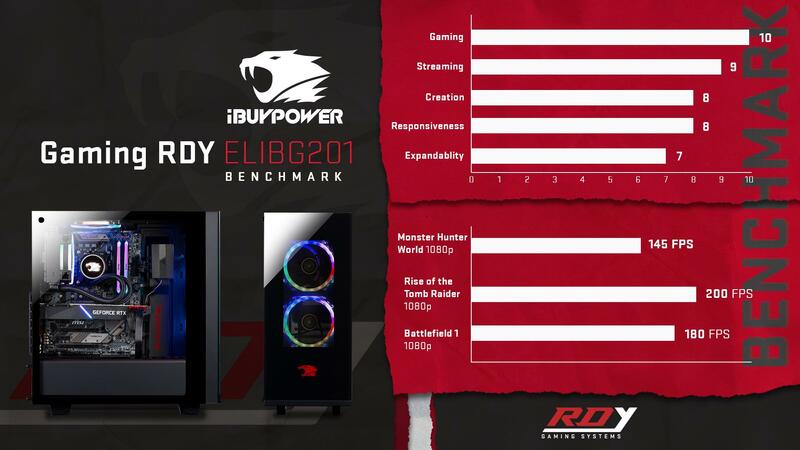 Check out iBUYPOWER Gaming RDY systems at https://www.ibuypower.com/Gaming-RDY-PCs to see how their systems take on DIY prices. iBUYPOWER has worked intimately with brands such as Intel, NVIDIA, AMD, MSI, Microsoft, Western Digital, Asus, Bethesda, MLG, and many more. Superior performance, reliability, cutting edge technology, and timely production make iBUYPOWER the authority in PC gaming.